Homemade and sugary baked goods are my favorite. However, sometimes the thought of slaving three hours in a kitchen just to satisfy my sweet tooth just doesn't appeal to me. For those times, I introduce to you the galette. According the my favorite internet encyclopedia, the word galette is a term used in french cuisine to designate various types of flat, round or freeform crust cake. I interpret this definition to mean that taking a frozen, leftover, pie crust and stuffing it with butter, sugar and fruit is not only acceptable, but tres french and classy. 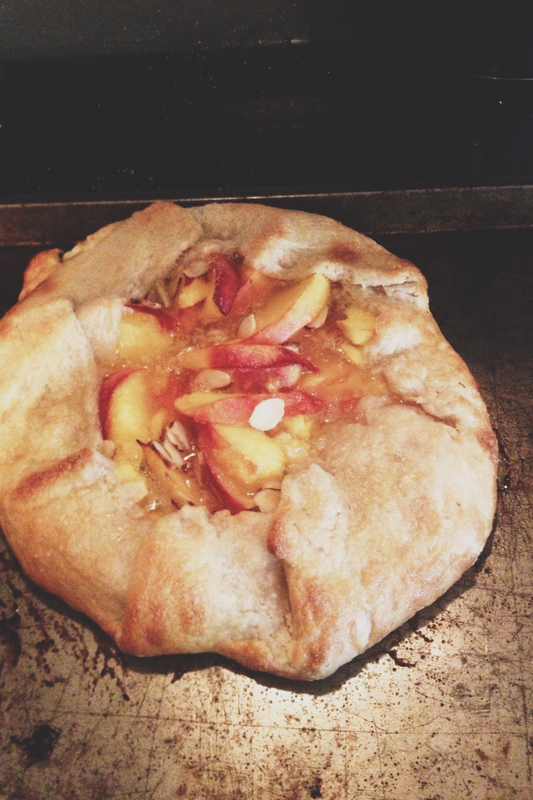 Making a galette is the easiest dessert to make. Simply roll out a pie crust, add your fruit of choice, a couple pads of butter, a sprinkling of sugar and rollup the ends. Voila! You have the classiest, easiest, frenchy-est dessert ever. And remember, I am not a lazy baker, I am a french galette pastry master. Preheat the oven to 425 degrees. Roll out the pie crust on a floured surface and then transfer to a baking sheet. In a large bowl, add sliced peaches, sugar and flour and toss the coat. 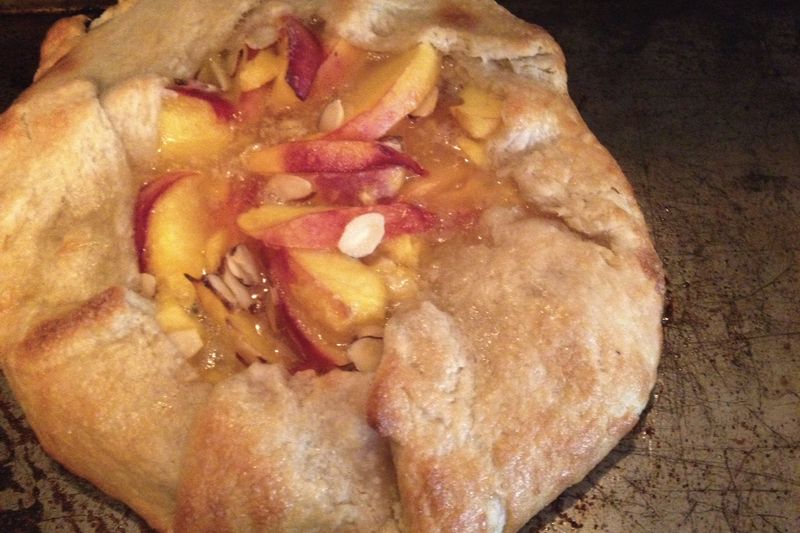 Evenly fan the coated peaches onto the pie crust. Sprinkle sliced almonds on top of the peaches. Fold the pie crust edges up and over the peach filling. In a small bowl, whisk the egg. Use a brush and coat the dough with an egg wash. Sprinkle the entire top of the galette with sugar. Bake for 20-30 minutes or until dough is golden and crisp. Allow to cool for 30 minutes. mmm! i'll take up any excuse to roll things up in butter and carbies! I have never heard of a galette but this looks easy enough to try, I love easy baking that doesn't require 60 minutes of prep and 20 ingredients. I just found your blog through googling Sarah Vickers since I just found out who she was 30 minutes ago, and I loved your blog entry on her from a while back! Totally agree with everything you said, and as much as I'd like to look at pretty people and things and be jealous, your blog is way more up my alley. We're about the same age, have the same active lifestyle, like food and clothes, and you are not afraid to actually talk about yourself and be goofy! Plus, I've always wanted to go to Colorado (I'm from the bay area in California) so I hope to see bits and pieces of it from your blog. This was a long winded way to say thanks for being real, entertaining, and IMO, better than Sarah Vickers. : ) Looking forward to following you and reading all your past posts! Been 2 months! We want more!